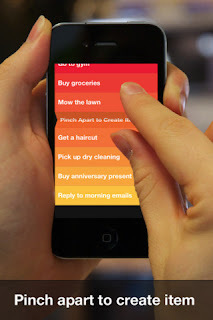 Recently I have fallen in love with a ToDo list. I hope this won't be too embarrassing for you, but I have taken it out on dates. In fact, I take it everywhere with me. I even sleep with it. Now, now. I realize I can't marry it…yet…but we are truly inseparable. A good ToDo list gets out of your way and just lets you write things down. Anything that tries to improve too much beyond the pen and paper paradigm becomes a different beast entirely. That's not to say that ToDo apps with recurring ToDos and alarms and Swedish foot massage are bad. I like getting my feet rubbed, but sometimes I find the overhead on those more powerful but complicated apps makes me put off using the app. Any app that ends up encouraging an ADHD person to rely on his memory instead is not one I can recommend. That being said, I find that simple ToDo list apps are rather boring. Look at Apple's no frills Reminders. It's clean. It's nice. It's dull. Then along came Clear. As pointed out before, the clean design and UI elements make this app elegant to look at and use. The text is beautiful. The colors are pleasing to the eye. There are no buttons, boxes, or widgets to clutter the screen. Considering the mess most of my ToDo lists become, this is an added benefit. Clear features sound effects to provide audible confirmation to actions. People who find this annoying can turn it off in the app settings, but others such as myself will enjoy this added reward for productivity. Besides, I just know they'll be adding Star Trek sound effects as an Easter egg one day soon. Then I'll truly be living in the future. A recent update added Shake to undo quickly corrects accidents. The same update also let folks have tasks longer than 24 characters. I appreciate the clean look that 24 character tasks gave the app, but it was nice to see the devs respond to user requests and add these two features. One fun aspect of the app is the multiple color themes provided for variety. More on that in a moment. Each new list begins with an inspiring quote. Each cleared list rewards you with another. I like that extra touch, though I don't often see the reward; my lists never end. My favorite geeky ToDo list feature is the "Active List Count for Badge" setting. If you are like me, you have half a billion lists, but only one that you are actively using. Yet the app's badge shows a count for ALL TOTAL TASKS. Nothing is more daunting than seeing 547 in read hovering above the "Let's get things done today! W00t!!" app of your choice. Clear gives you the option of only displaying in the badge the number of tasks in your currently selected list. I love, love, love this feature. One flaw I have discovered in the Clear method is when one wants to move a task from one list to another. There is no way to do that easily. Instead, one must cut & paste from one list to the next. At the end of a busy day with multiple tasks uncleared, this can be a wee bit tiresome. It's not overly complicated, and I have it down pat now, but it is a bit tedious. I'd like to see a two finger hold and move operation implemented that let me move a task from one list to the next. Or tap and hold the task to the top of the list, then wait for the list menu to appear. Still, there is so much about this app that pleases. Simplicity and interest is a powerful combo for an ADHD mind. Aside from sound effects, Clear has more than the usual variety of color schemes to keep the app feeling new to me — something that I have found is key to sticking with any task manager system. Such a simple feature, yet not offered in most of the task managers that I have used. At first, I just played with the different themes until I found one I liked, but soon I discovered that I could avoid ADHD boredom by simply picking a new theme every few days. When I discovered that there were secret themes built into the app that one could unlock, I was hooked. The latest update added even more secret themes, some unlocked by using features in the app, and some linked to other apps as a form of promotion. I will be honest with you. If you are looking for a powerful task manager with priorities, due dates, repeating ToDos, and Swedish massage, Clear is not going to be an app you will enjoy using. However, if you want a ToDo list app that builds on the simple pen & paper version but with intuitive, modern features, then you owe it to yourself to check out Clear. Since I am currently unemployed, any support you folks can send my way will be very appreciated by my daughters and I. I write without pay here for the love of it and because I know many of you find what I write useful. Please donate, leave comments, or share this blog. Let me know I’m not whistling into the wind. And thanks for all the support you have given me in the past. I appreciate it all.